A boat packed with up to 250 African emigrants trying to reach European shores sank on Sunday off the Libyan coast and most are feared dead, a spokesman for the Libyan navy said. Only 26 people have been rescued so far, navy spokesman Ayub Qassem told Reuters, adding that the boat had sunk near Tajoura, east of the capital Tripoli. “There are so many dead bodies floating in the sea,” he said, adding that the under-equipped coast guard had few resources to search for survivors. Migrants have been streaming out of North Africa, mostly lawless Libya, in rickety boats in rising numbers for years. Many head for Italy. So far in 2014, more than 100,000 have reached Italian shores, the Italian government said this week. Qassem said the emigrants on the capsized boat were mostly Africans, among them women. Libya’s coast guard mainly exists on paper and relies on fishing boats and tugs it borrows from the oil ministry. 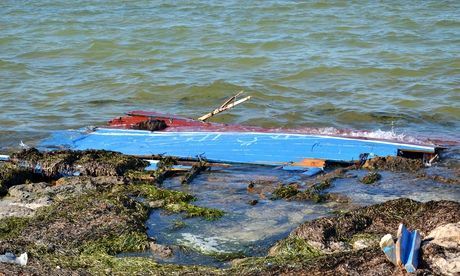 More than 100 African emigrants died in a similar boat accident in August. Posted on 15th September 2014 by newsafrica. This entry was posted in Africa, Libya and tagged Boat, Libya, Libyan Navy, Muammar Gaddafi, North africa, Reuters, Tajura, Tripoli. Bookmark the permalink.